Unbeweavably Original - Add a layer (or two) of weaving to your crochet work to create projects that are both distinctive and practical. You've decided to use the yarn that's been accumulating in your closet to revamp your home's look: "new year, new look," right? Only your brain is just recovering from holiday haze and there's this massive wall between you and your creative self. Determined to makeover your home and make room in the closet for the new year's accumulations, you opt for a simple pattern. Simplicity is sophisticated, they say. But when you finish, it seems super bland...too bland to brag about or even put anywhere. What should you do? Don't destroy it! By weaving through the stitches, a simple and possibly too thin throw, doormat, place mat or coaster can be transformed from a crochet skeleton to one of the most original pieces in your home. To spice up your piece, select a color of yarn that complements the color of the yarn you used for your completed project and one that matches the general color scheme in your home. 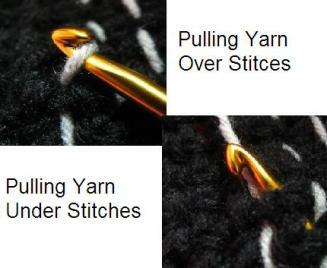 Weaving through your stitches will be made very simple if you own a crochet sewing needle. If you don't own one of those, the weaving process can be accomplished with a crochet hook whose gauge is appropriate for the type of the yarn you are using for weaving. Assuming you have no fancy weaving equipment, it is best to begin by taking the free end of your supplementary skein and unraveling as much of the yarn as you can without getting yourself tangled in knots. 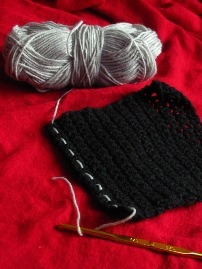 Feed this end through every other crocheted stitch following an "over one, under one" rule. It may seem, at first glance, that working with the free end will cause you to run out of yarn in a few rows and that perhaps keeping the free end static, looping the yarn around the hook, and continuing on that way would make more sense. Unfortunately, if you go this route, you will end up pulling at the free end, thereby undoing all the work in the earlier rows. If you have children who love to help you do things (or that are being punished) or you have friends who are very dedicated to your craft, having them hold the free end while unraveling the skein will eliminate the problem. But, how many of us yarn lovers have friends or children that devoted to our crafts? If you are lucky enough to have loved ones so committed, then by all means, try it this way. To all of us who don't, skip trying this method. Eventually, if you're weaving by using the first method, you will run out of excess on the side you are working with, which will make weaving the rest of the project impossible. 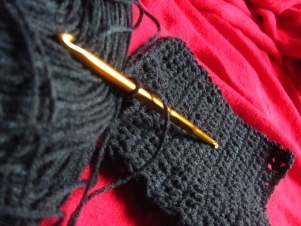 In order to make lengthening the excess simple, a few things can be done at the end of each row. One thing you can do is keep the yarn very loose at the end of each row. To accomplish this, insert your finger in the loop of your weaving yarn between rows while you pull the excess through the newly completed row. Upon doing this, you will form unattractive loops at the end of each row that can be pulled one by one after the skein of yarn has been unraveled; this will lengthen the excess end that you are working with. Another thing you can do is unravel the skein of the yarn a little bit more after every row and pulling the extra excess through each newly completed row. Both methods accomplish the same thing and both are equally easy to do. 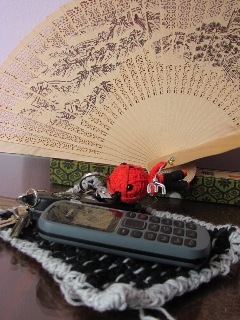 How much weaving you do will depend on the pattern you decide to go with. If you weave in one direction only you will get lines of different colors that are either parallel or perpendicular to your crochet stitches. If you weave in two directions, you can make either L-shaped patterns, if you weave in a direction perpendicular to what you have already weaved, or V-shaped patterns, if the second direction you weave in is at a forty five degree angle to what you have already weaved. Doing this will give your transformed project a bit more complexity and depth. You can weave in as many as four directions; how many directions you weave in will depend on how intricate you want your project to look in the end. Your transformed project will also be thicker depending on how many ways you weave through it. 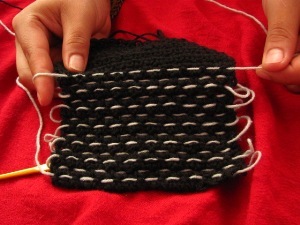 When you finish, you'll have to get rid of those loops at the end of each row and either hide those ends or create fringes around the entire project. 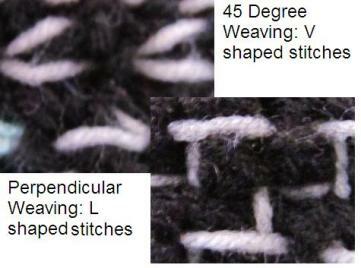 The way you choose to hide your ends will make your weaving more secure and can give your project a unique finishing. If you simply tie off the ends and weave the fringes into other stitches of your work or other fringes, if you have decided to add fringes, your project may become unevenly tightened if a portion of the weaved yarn gets caught on something. To avoid uneven tightening, feed the excess through all of the loops at the ends of each row before trying to hide the ends, so if a portion of the yarn gets tugged it won't tighten as awkwardly or easily. To get rid of those loops, just pull on each row's loop as you may have been doing to lengthen your excess so that the one before it is completely gone. Only after you have tightened all the loops should you tie off the free ends. To hide the ends most effectively, crochet a row of crab stitches, which is basically a single crochet stitch that is worked backwards, all the way around your work and weave the ends into these stitches. The crab stitch provides a subtle but sophisticated-looking edging that works extremely well in hiding those unsightly ends. Once you finish all this, give your completed project a new home and enjoy it. Oh, and prepare yourself for compliments on your "unbeweavably original" creation. Jen Salinas spends most of her time making things of yarn, reconstructing clothes, writing her heart out, and traveling. Jen is a contributor at HotNewsMakers.com, an up and coming news blog, and regularly blogs at LivinginTransit.com, where she shares stories, advice, and pictures of her travels while on her mission to explore the world. Her current location? Kuala Lumpur, Malaysia.